This project was a partnership between MIET AFRICA, the South African Sugar Association (SASA) and the KZN Department of Education’s nutrition and curriculum units to develop a nutrition resource pack for teachers and learners in Grade R-6. 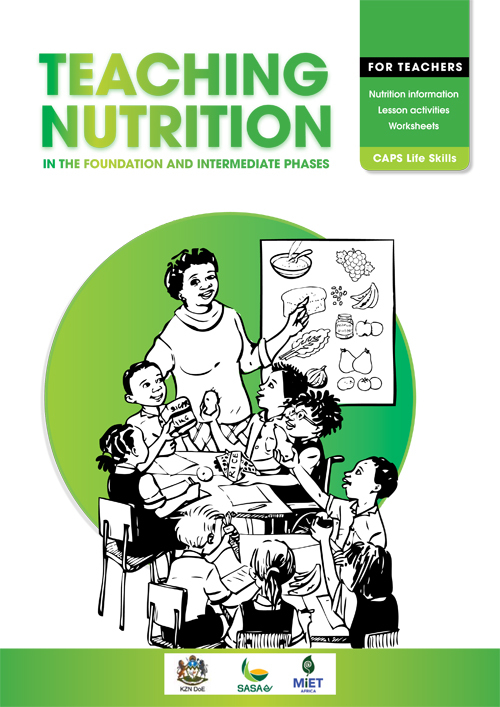 This nutrition pack comprises a teacher guide to teaching nutrition as part of the Life Skills curriculum in the foundation and intermediate phases. It includes nutrition information for the teacher, lesson activity ideas and CAPS-compliant grade-specific activity sheets for learners. The guide is accompanied by three readers, one for each of Grades 4-6.These colourful and attractive readers, entitled “Looking after your Teeth”, “Food from around the World!” and “A Case of the Runs–A Detective Story About Food Safety”, also address curriculum-specific nutrition topics.